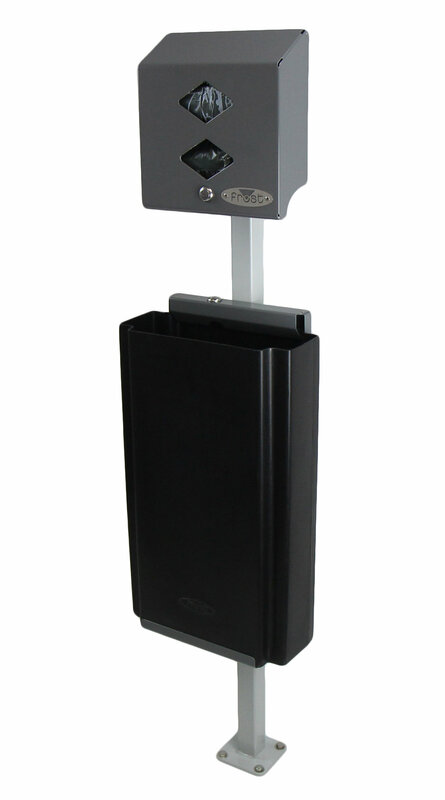 Dispenser: 18 gauge steel with RAL super durable TGIC-free polyester powder coating which provides a rust proof finish. Bracket for the disposal: 18 gauge steel with RAL super durable TGIC-free polyester powder coating which provides a rust proof finish. Disposal: 100% recycled polyethylene, black finish. Pedestal: Vertical support is 2" x 2" cold rolled steel tubing (14 gauge). Mounting plate is 1/8" cold rolled steel. Ground mounting plate is 1/4" cold rolled steel. All welded construction. Exterior grey polyester rust proof finish. Tested to survive harsh summer and winter weather. Consumable Bags: High density plastic bag, green in colour. The 2013 complete pet waste system is perfect for any area with high traffic pet ownership. The system is designed for outdoor use in and around public parks, condominiums, residential paths, schools/universities, and common courtyard areas. Capacity: The dispenser holds two boxes of disposable bags. Each box holds 200 bags. Total capacity is 400 bags. Disposal: 18.75 litres (4.1 imp gal, 5.4 US gal). Bag size is 8" x 13" (20.3cm x 33cm). 200 bags are in each individual box. A case includes 10 individual boxes. There are a total of 2,000 disposable bags in a case. Installation: Secure disposal mounting bracket to pedestal using bolts (4), braces (2), and nuts (4) provided. Make sure the bracket for the disposal is in the unlocked position, then slide the black disposal into the top of the bracket first. The bottom of the disposal will then slide into the bracket and lock into place once the key is turned. Secure dispenser to the pedestal plate with bolts and nuts provided. Secure pedestal to ground with appropriate anchoring system for floor material. Use ground plate as a template to locate mounting holes. Drill holes and set anchors as required. Warranty: 1 year warranty against defective workmanship. Maintenance: Normal preventative maintenance and cleaning will keep Frost products functioning properly and may extend normal product life. Products should be wiped down with a damp soft cloth periodically. Do not use harsh detergents or chemical cleaners. Maintenance staff should periodically inspect bag and waste levels based on site usage.